We don’t get to say this much, but this was a good week for renters in Sacramento. Despite realtor and landlord campaign contributions and the undue influence they bring, a number of good renters’ rights bills have made it through the minefield of the California State Legislature and are now on the Governor’s desk. Governor Jerry Brown has 30 days to sign or veto the bills. 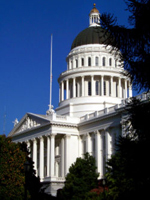 Authored by Assemblymember Tom Ammiano (D-San Francisco), AB 1953 plugs a loophole in California law which has allowed successor landlords, especially after foreclosure, to wait months before notifying tenants of an ownership change and where to send rent. AB 1953 passed the Legislature this week and is now in the Governor’s hands. Existing California law in theory requires new owners to notify tenants within 15 days of an ownership change, where to pay rent, and whom to contact for repairs, but does not say what happens when the new owner fails to comply. Under AB 1953, a new owner who delays in notifying a tenant where to pay rent would not be permitted later to evict the tenant for nonpayment of rent that accrued during the period of the owner’s noncompliance. By creating a consequence for failing to properly notify tenants of ownership changes, the bill seeks to increase compliance with existing notification requirements and protect tenants from unnecessary confusion and evictions. Authored by Assemblymember Nancy Skinner (D-Berkeley), this bill is part of the Attorney General’s “Homeowner Bill of Rights.” The bill would improve state law protections for tenants after their landlord’s foreclosure by requiring at least 90-days eviction notice to tenants after foreclosure, protecting specified leases after foreclosure (tracking federal lease rights that are set to expire in 2014), placing the burden of disputing leases on the post-foreclosure owner, and amending “pre-judgment claim” rules to plug a loophole banks and investors have used to evict tenants without ever naming them in eviction proceedings. The bill passed the Legislature this week. Authored by Senator Ted Lieu (D – Torrance) and sponsored by Coalition for Economic Survival and Western Center on Law and Poverty, this bill would prohibit a landlord from requiring online payment as the exclusive form of rent payment. The bill responds to “online only” rent schemes that are designed to force out long-term, rent-controlled tenants. The bill unanimously passed the Assembly and Senate and is now on the Governor’s desk. Authored by Senator Joe Simitian (D-Palo Alto), SB 1191 would create a statutory duty to disclose notices of default to prospective renters. All too often, landlords conceal from prospective tenants the fact that a notice of default has been filed against the property, the first step in the foreclosure process. Tenants learn of the upcoming foreclosure after they have shelled out money for rent, deposits, and moving costs, and moved into their new home. This bill specifies remedies in the event of nondisclosure by the landlord. Specifically, the bill would provide tenants the option to void lease and sue for damages (twice rent or twice actual damages), or elect to stay in possession and deduct one month’s rent. The bill is limited to 1-4 unit buildings. The bill passed the Legislature and is now on the Governor’s desk. To make sure these bills become law, call Governor Brown at (916) 445-2841 and urge him to sign AB 1953, AB 2610, SB 1055, and SB 1191. Dean Preston is the Executive Director of Tenants Together, California’s Statewide Organization for Renters’ Rights. For more information about Tenants Together, visit www.TenantsTogether.org.